FILE PHOTO: The Public Accounts Committee in session on February 19, 2018. 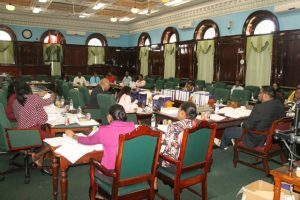 The Ministry of Communities has suspended the appearance of Regional Executive Officers of the 10 administrative regions before the Public Accounts Committee (PAC) to allow them to better prepare to answer questions, but opposition People’s Progressive Party Civic (PPPC) parliamentarian, Juan Edghill has objected, saying the REOs have failed to consult the experts before each sitting. “While the ministry is desirous of seeing this process through expeditiously, we are constrained to take this course of action due to the recent unsatisfactory level of performance before the PAC. This time will be used to have regional officials better prepare to assist the PAC in carrying out its mandate,” Mc Garrel states in the June 26, 2018 letter released to the media by Edghill. The REOs are appointed by Central Government, while the number of councillors are elected at the same time with general elections, the last one having been held in May 2015. The PAC should have met on Thursday, July 5, 2018, but it has now been postponed to next week Monday. Over the past several months, a number of REOs and their support staff have either made severe blunders, admissions or failed to provide adequate answers posed by PAC members, resulting in embarrassments for the Regional Councils and Central government. disagreement to this request and I further object to Public Officers stymieing the work of the PAC,” he said.